We want to help add fun to your event, and a photobooth is always an extra bonus for you and your guests to have a GOOD TIME! We provide everything you need, even the props! Then it's up to you to create your most original shots! Our INDOOR BOOTH size is 6' wide X 7' long and 7' tall. An area of at least 8' X 12' will be required for booth set-up. This usually works best in the corner or along the wall of your event location, but we're always up for being the center of attention too! 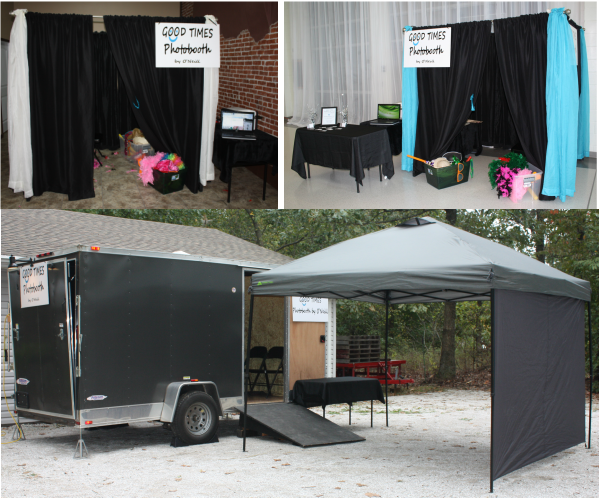 If your event calls for something smaller, we are able to adjust the size of the photobooth. The smaller version of our booth is 3' wide x 5' long x 7' tall. *An electrical outlet is needed at every event. Our standard booth colors are black and turquoise, but you also have the option of requesting black and ivory, or all-black to help coordinate with your event colors. Our photobooth is wheelchair accessible and can hold groups of people at a time. We have had up to 25 people in the booth at one time! Our OUTDOOR BOOTH has an inside size of 6' wide x 8' long x 6' 6" tall so that all guests may enter the booth and not feel confined. This booth is also wheelchair accessible. The trailer needs a space of 8' wide x 16' long. Inside the booth there are hats, toys, and other costume pieces to help add to the fun of your photos. You can use as many or as few as you like! If your event calls for a more formal setting, we will leave out the props. Prints are dry and ready to distribute within seconds of exiting the booth! We use a Canon T5 Digital Camera with an Alien Bees Flash Unit. The camera focus is adjusted for each shot to assure the best pictures possible! An added bonus to our photobooth is that we have a screen outside the booth. Those waiting in line can watch what is happening inside! Guests have a choice of color or black and white photos every time they enter the booth. Photos print within seconds of you and your guests completing your "photo shoot." A photobooth operator will remain on-site for the duration of your event. In addition to a copy for your guests to take home, your images will be posted on our Facebook page, where you and your guests will be able to view and "tag" pictures from your event. Check our "rent the booth" page for more on pricing and products. Also check out the "FAQ" page!